I think it's safe to say we've had too much a lot of rain in NYC lately. Not gonna lie... I'm kind of over it! I just want sunshine! There's a little story with the theme of today's post. I purchased my first umbrella in NYC when I moved here last August. I remember being so upset that I spent $15 on it but it was a situation where if I didn't get an umbrella right then and there I'd either get caught in the rain or have to duck for shelter for who knows how long. I managed to keep that umbrella until last week when I accidentally left it at a work HH. Of course when I called the next day, they didn't have it. Le sigh. My faithful, trusty black umbrella was gone. Then I realized, I could upgrade my umbrella situation! 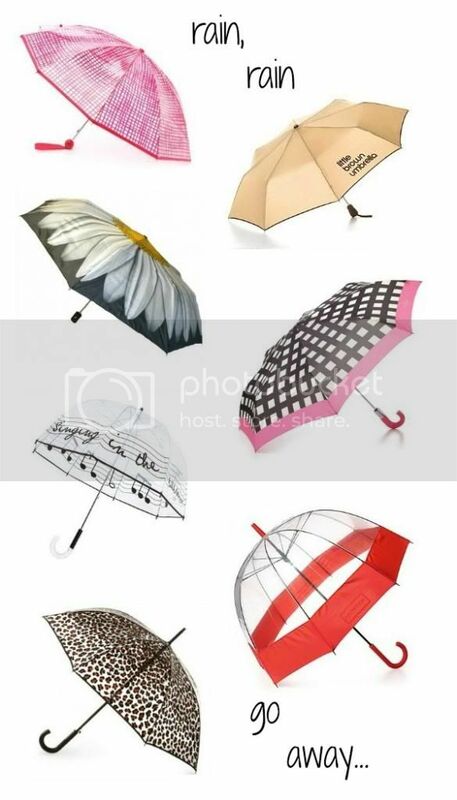 Cue scouring the internet for cute umbrellas (see below).